Evening visit until 10pm close. 2 or 3 in. Evening visit until 10pm close. Lively full house with someone's birthday celebrations and a lot of beer being sunk as a consequence. Evening visit until 10pm close. Evening visit until 10pm close. 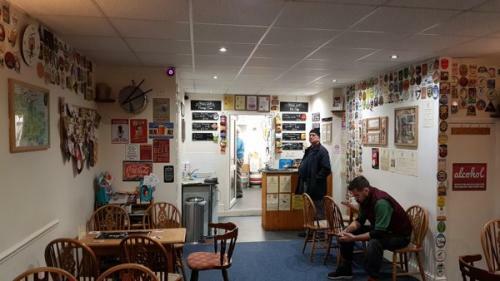 A micropub at its best, just a small group around the bar with constant conversation. Evening visit until 10pm close. The masses of glasses for washing told of a record breaking day's sales. Iron Pier - Amber 3.90 Oh no, a boring citrus juice job. Aptly this on Pancake Day! Evening visit until 10pm. The Guv seated and quaffing our side of the bar tonight. Evening visit until 10pm close. A tin of Nitromors was at the ready for some table top varnish removing after we left. 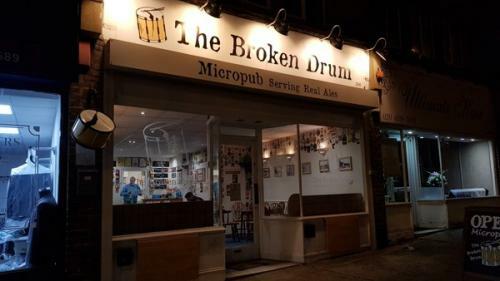 The pub is found in Blackfen, Greater London, DA15 9PT. Bexley Borough's 3rd Micropub shop conversion in Westwood Lane planned to open in Spring 2015 sometime just after Eastertide. Finally opened on Friday 17th April 2015. Named after an inn in a Terry Pratchett novel. Formerly a nail salon called Simply Nails. Real ales and ciders sold under gravity dispense from a temperature controlled cellar room visible through its glazed door. 2 level wooden stillage holds up to 10 casks. A settle in each bay window and low tables and chairs provide the seating. Unisex toilet. Has a small bar counter in one corner. Note that last sales are 30 minutes before the advertised closing time. SPBW London Pub of the Year 2018. Local CAMRA branch Pub of the Year 2018. Cash only, no card payments permitted. We have visited this pub 135 times, seen 309 different beers and tried 209 of them.